The report yesterday that the Red Sox have contacted agent Scott Boras about free agent slugger Jayson Werth wasn’t so much a newsflash as it was a ceremonial first pitch in a game of the inevitable. 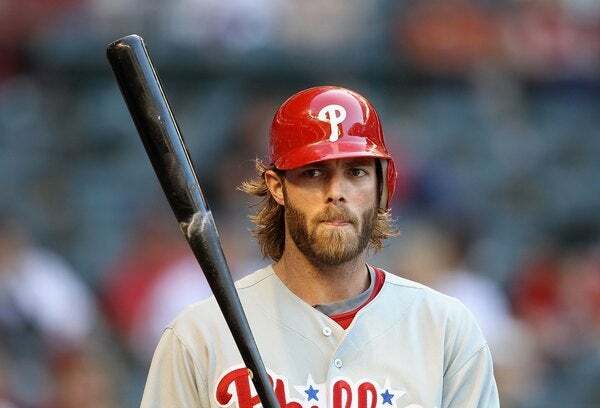 It’s cool to know formally that they’re interested in Werth, the 32-year-old righthanded-hitting Phillies slugger who’d be an ideal No. 5 hitter in . . . well, just about any lineup. But the real news would be if they weren’t interested in a five-tool player who hasn’t had an OPS below .861 in the past four seasons and could fill a huge need. That they’ve expressed interest means it’s time to play ball more than anything else. The same applies to the other superbly talented outfielder on the market, Tampa Bay’s Carl Crawford, whose skill-set differs from Werth’s (less pop, more speed, weaker arm, better range) whose appeal is apparent to anyone who has ever seen him play (he’s definitely on the Red Sox’ All-Tormentor team over the past half-dozen seasons or so). Or for that matter, to anyone stumbled upon his baseballreference.com page and noticed that he’s 29 and is coming off the best season of his career with personal highs in adjusted OPS (134), homers (19), RBIs (90), slugging (.495), and OPS (.851). I don’t know if they’ve officially expressed interest to his agent yet, but Peter Gammons tweeted a few weeks ago that the Sox covet Crawford, and you have to figure the effect is pretty similar there. Anyway, the point, or at least a question I’ve been pondering. I’m thinking maybe you guys can help me come to a conclusion on this, because my conclusion seems to be changing daily. Provided that the Red Sox can sign one of these players — Jayson Werth or Carl Crawford, either/or but not both — which one would you prefer? I realize there are other variables here, for there are more moving parts and if/thens with the Red Sox’ roster than I can recall during any other recent offseason. Werth’s appeal as a middle-of-the-order hitter may hinge to some degree upon whether the Red Sox re-sign Adrian Beltre or Victor Martinez. And Crawford might be a bit redundant with Jacoby Ellsbury, presuming he’s not traded, and I seriously doubt he will be. Ellsbury needs to rebuild his value, and Theo is patient enough to resist any temptation to sell low. And of course, there’s the entirely realistic chance both choose to make their next baseball home elsewhere. They are the diamonds of a free agent class of hitters that has way too many cubic zirconias. But if they can get one . . . who should it be? Crawford is younger, historically more durable, and in his prime right now. Werth has more pop, surely would make a habit of denting the Monster, but has an unusual career arc in that he’s peaking after age 30. Werth is repped by Boras. Crawford is repped by the somewhat less notorious Brian Peters. Werth might be the best fit in the immediate future. Crawford might be the best fit in the long-term future. Werth ranked 28th in Fangraphs’ version of WAR among offensive players last season, sandwiched between Scott Rolen and Jason Heyward. Crawford was ninth, between Matt Holliday and Troy Tulowitzki. Hmmm, you know, that last item might be the best case yet for Crawford. But Werth at Fenway is so tempting. Help me out here, people. Vote in the poll, say your piece in the comments, and tell me how you see it. Then maybe I can see it clearer . . .